Ariana Grande will return to Manchester for a special benefit concert to be shown live on BBC One on Sunday. Some of the proceeds will go towards the Manchester Evening News’ ‘We Stand Together’ campaign. 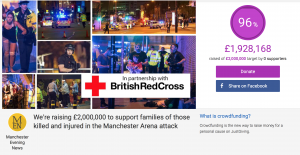 The fundraiser - for families of those killed or injured in the bomb attack at Grande’s Manchester Arena concert last Monday - is nearing a new target of £2million. The initial target, set at £250k, was surpassed within hours and has been raised several times since. Justin Bieber, Coldplay and Katy Perry will join Grande at The One Love Manchester show at Emirates Old Trafford. The three-hour concert will be broadcast live on BBC One, from 6 to 9pm, as well as on BBC Radio and Capital Radio. The show will raise money for those affected by the attack, which left 22 dead. Grande is offering free tickets to fans who were at her Manchester Arena show. Tickets for the tribute concert go on sale on Thursday, with prices yet to be announced.